The CO2 air control observer ensures the right climate in your office. The CO2 air control observer measures the CO2 air concentration, the relative air humidity and the room temperature. The CO2 air control displays the carbon dioxide concentration up to 3000 ppm, temperatures between 0° and 40° C, and relative humidity between 20…90%. 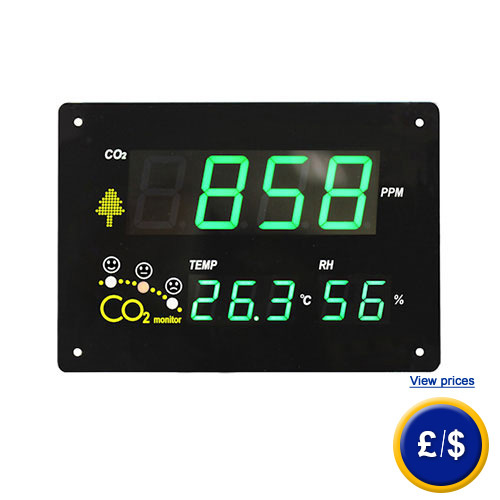 The equivalent data can be shown directly on the CO2 air control observer’s large display. Furthermore, a smiley display gives objective information about the air quality based on the CO2 concentration. The colourful design of the smiley emulates a traffic light so that assessment of the room’s air quality becomes easier. In case the CO2 air control observer should not be in your line of sight, an acoustic signal reminds you to open the windows in case the pre-set limit is transgressed. Thus, the CO2 air control observer is a simple but useful device to monitor and improve air conditions. The CO2 air control observer is therefore especially qualified for offices, schools, public buildings and hospitals or any building or room in general that people are staying in. If there are any questions about the CO2 air control observer have a look at the technical specification below or call: UK customers +44(0) 23 809 870 30 / US customers +1-410-387-7703. Our technicians and engineers will gladly advise you in all CO2 air control observer and all products in the field of measuring instruments, regulation and control and scales. 20 ... 90 % r.h.